I am a lucky Geographer to have a good friend like Matt. Last month he was on an epic journey to places that I only dream about and being the good friend he is, he sent me some post cards that I can now brag to all of you about. 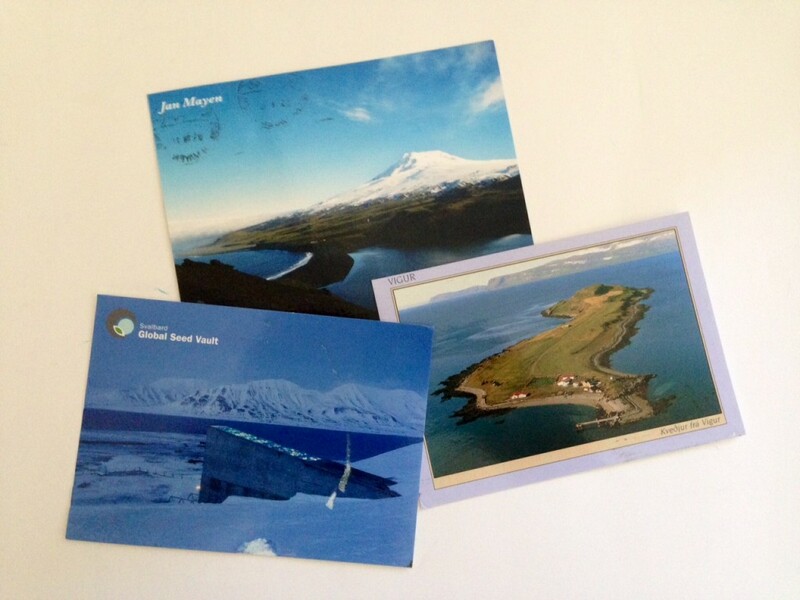 The three post cards are from Vigur, Iceland (A small spear shaped island in the North West part of the country in the Ísafjarðardjúp. I’m sure that roughly translates to Iceland Fjord), Svalbard Global Seed Vault (located on Spitspergen in the far northern section of Norway – practically the North Pole! ), and finally Jan Mayen (actually part of the same province as Svalbard, but farther away and between Iceland and Norway – Matt actually visited there first, but since they are a remote military post, the mail took over a month to get to the mainland and then posted to the US). Super neat to get notes from these remote reaches, and I only hope that when he visits the South Georgia and the South Sandwich Islands he remembers me as well!! This entry was posted in Friends, Travel on August 15, 2014 by clubjosh.